There are plenty of gold prospecting books for the beginner, and many that are written on advanced topics, but what about the amateur? 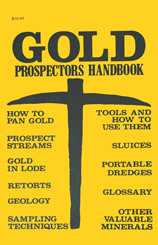 The Gold Prospectors Handbook fills that gap in between. Find out how to become more proficient at prospecting and small mining operations...learning just one new thing can make all the difference! This book is a 5.5" x 8.5" paperback with 176 pages. II. Is There Any Gold Left?